This iExpression links an arbitrary property to the rotation of a layer or any other value representing an angle, like an Angle Control. You can keyframe your property as usual specify a first and a last frame and then the keyframes between the first and the last frame are played in a loop for each full rotation. This is similar to a Linear Link Time Remap, but has a cyclic behaviour such for each full rotation, the same animation is played again. Don't put a number here. 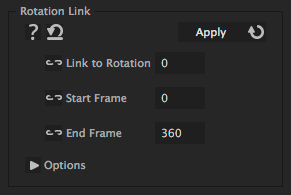 Use the link button to link this to the rotation of a layer or any other Angle Control. the number of the first frame behind the region that should be played. After how many degrees of rotation the animation starts again at the beginning. 360 degrees means that after one full rotation, the animation starts again at the beginning.